Caffe Latte (RM6.50/USD2) – Since Coffee Chemistry Cafe (CCC, for short) prides on their imported Graffeo coffee beans; seemingly one of the finest beans in the world, you’d be hard-pressed NOT to order a cup for yourself. Defeats all the previous exercises of kicking the caffeine habit though …. but this cup of creamy, aromatic brew without the slightest tinge of bitterness got me hooked. I was first led to this cafe through their Facebook page. 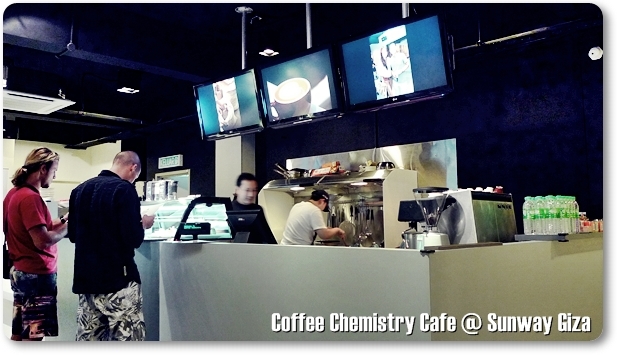 Started up sometime in the mid of January this year, CCC has been steadily attracting the coffee-appreciating aficionados in and around Kota Damansara. To imagine a place so obscure (they’re parked on top of Movida, and without ANY signboard upfront that particular evening), sharing a premise with Cubic platform (an HTC dealer) yet you can find people stumbling upon this quaint space occupied by a bar, sparsely-placed tables and chairs, and a semi al fresco seating arrangement at the balcony overlooking the crowd beneath. 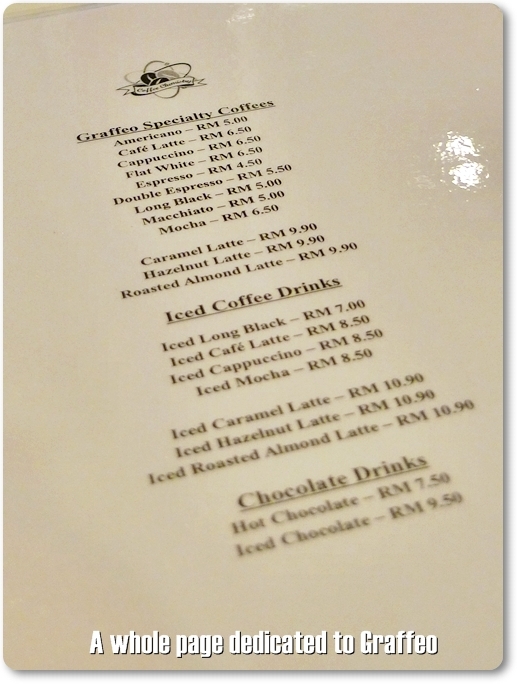 Read on and find out just how a good cup of freshly brewed Graffeo coffee (by an experienced barista, no less) is priced at barely half of what the others are selling …..
Catchy wall huh? 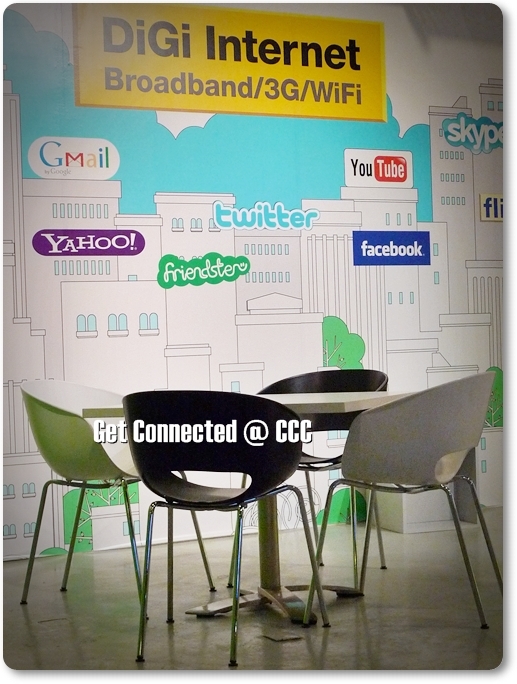 Stay connected at CCC as they’re equipped with UniFi, and they don’t chase customers away. Remember I mentioned that this is on top of Movida? You have to walk up the stairs beside of Movida, a good two flights or so before reaching a door adorned with Cubic’s brand. Ahem. I admit I got confused, seeing that I was not in the mood for some smartphone-shopping that very evening, but was desperately searching for that caffeine kick to perk myself up. Yeah, I drink coffee 24/7, nothing that can keep me awake in the middle of the night, anyway ….. Choose your brew from the list of Graffeo specialty coffees. One plus point about the coffee is that; the coffee ain’t that strong, robust type with a bitter aftertaste. This suits me just fine since I am no fan of long, black but always had mine with cream and foams. Only to peek in and saw the counter/bar that I vaguely remembered seeing from the FB page. Yes, this has to be CCC, albeit slightly disparaging thought since I expected the cafe to be a full-blown establishment, preferably with a plush sofa in one corner and good reads stacked up in the other. But all was forgiven since one of the owners, Johnson took the time to explain that this was more or less a test run for CCC. They are on the expansion route; not so much for branches yet (though sooner or later CCC’s gonna be a brand attached to Cubic Platform), but injecting this current premise with some pizzazz …… turning CCC into a cozy retreat for the masses. Just a spot where you can waltz in after the working hours, forget about the day’s bluesy turnout, and seek solace in a cup of coffee with a satisfying wrap at hand (they have decided to change the boring old square-triangle sandwiches into healthy wraps). 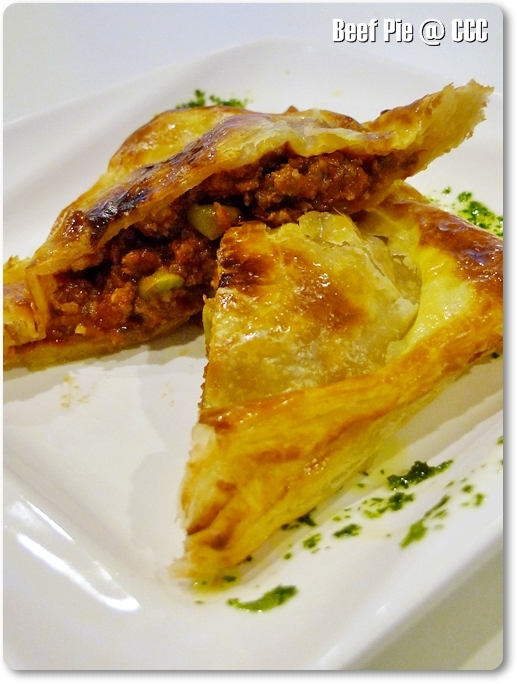 Minced Beef Pie (RM5.90/USD2) – Not in the menu, but you shall be prompted to choose if you’re looking for pies. They have chicken & mushroom pies too, listed in the menu. 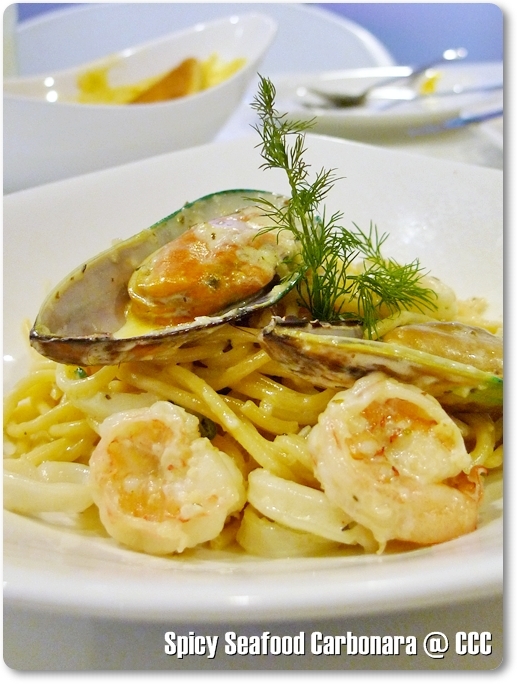 Spicy Seafood Carbonara (RM14.90/USD5) – You can request for the usual creamy, non-spicy version. But this spicy one comes highly commendable, with bits of chopped cili padi (bird’s eye chillies) for good measure. Their repertoire includes various salads, homemade soups, light bites, sandwiches and wraps, as well as several pastas. And nothing was priced at above RM20 each, so you can go crazy and share the food with dining companions and yet won’t get your mood dampened by an exorbitant billing. 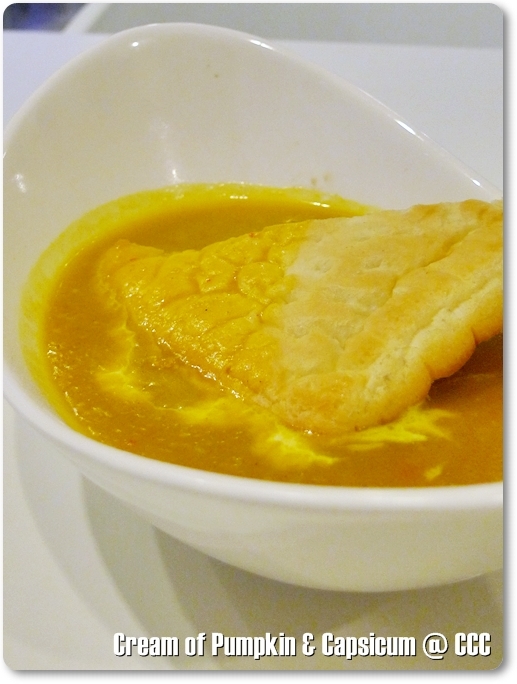 The pumpkin soup in particular was delicious; the serving sufficient as a light lunch, paired with a cup of coffee. Go for their pies too, as I was informed that they use good quality imported beef for the minced meat fillings, instead of the ones readily available from the supermarkets. On the house; a slice of Hazelnut Chocolate Cake (I think it was, but barely discernible that moment). Not their own production, this was outsourced but truthfully, this should not be in the counter this very moment. Even Johnson realized this. Basic, contemporary and functioning counter with three LCD TV to display the slides of photographs, and soon to display their menu to ease ordering. Certainly looked to be an encouraging effort, at least I can safely pick a good spot for coffee and light bites when I am in Sunway Giza, instead of going rounds and ending up at Fullhouse, Movida or Wong Kok Char Chan Teng. Now, let’s see if we can round up enough coffee ‘kaki’s’ for the next session. The flavoured lattes (hazelnut, caramel, roasted almond) sound like killers alright! Kota Damansara, Petaling Jaya, Selangor. *On top of Movida Bar & Lounge. 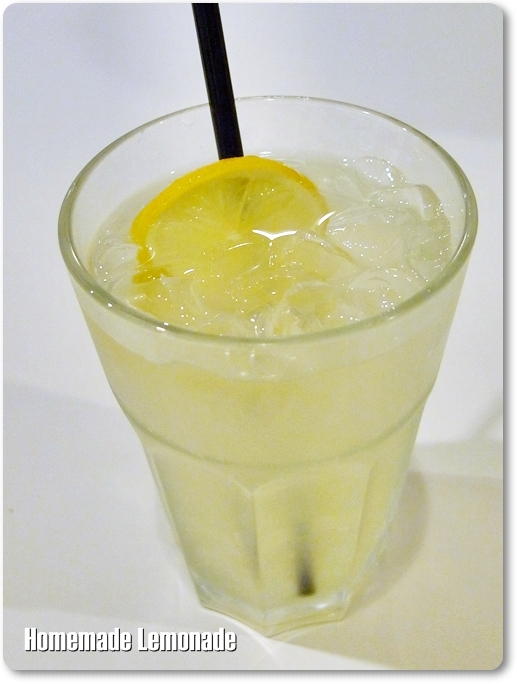 Read Sean of Eat Drink KL’s review, and Augustdiners’ take on CCC. I wouldn’t wax lyrical over the food selection, but they do a very good version of pumpkin soup and carbonara. Dollar for dollar, that’s definitely a deal. The Cafe latte looks GOOD! 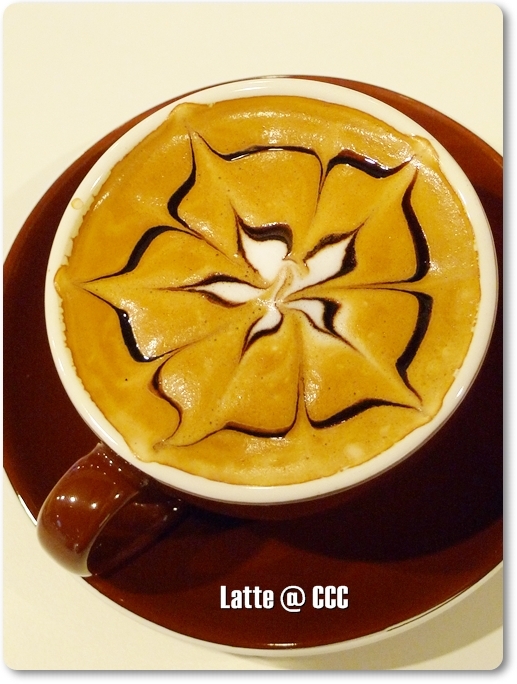 Even though I’m not a coffee lover, I feel like ordering a cup of latte just because of its gorgeous coffee art! Thanks! And happy CNY. Are you guys back to hometown? hey bro…..wow…awesome review …and glad u enjoy it … hope to c u again … thanks for coming! btw, do u mind i post this up in my fb fan page? Hi there vialentino. Nope, I don’t mind. Keep up what you’re doing, and I’ll be sure to drop by again very soon. Maybe for the salmon wrap. 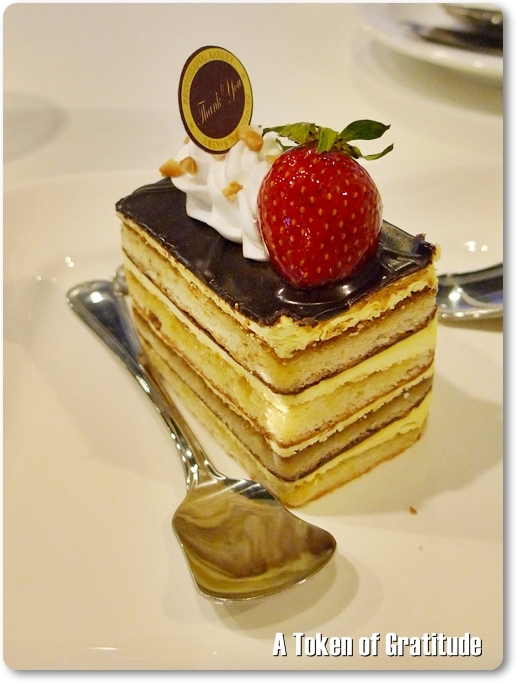 Wow~ Awesome coffee and food…..I’m going to try out very soon! Thanks Kenny. But do go for their coffee instead. After all, they ARE named as such for a reason! Hi vialentino, you can find me on FB with the same ID I am using on this blog. Alright, new place to hang out at Giza after class next time! SOrry Edwin, maybe gone to spam folder. Wait let me check. Sometimes the filter too sensitive. No problem bro, just said nice pictures and review! I also said http://www.ilovediscounts.my now doing a offer for only rm7.90 for this place. Sure, I’ll seek for that offer then. Gonna have another coffee session there pretty soon. Keep up the good work! You recognize, a lot of persons are searching around for this information, you could help them greatly.